We hope that you will enjoy these revolting facts! 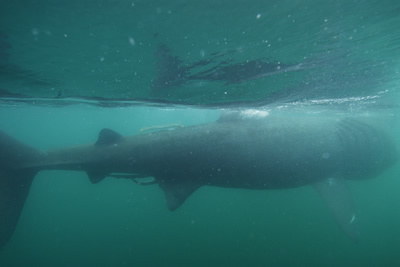 FACT 1: Basking sharks have long thin fish called lampreys stuck to their skin around their bottoms! FACT 2: Basking sharks find their dinner by smelling and tasting the different fishy smells in the water. The huge basking shark eats millions and millions of tiny shrimp called plankton. Imagine being a basking shark and having shrimp soup for every meal of your life! This great cartoon is by Derek Pitman, why don’t YOU draw a cartoon of a basking shark? FACT 3: How would you like to have 10 big bristly brushes in your mouth! 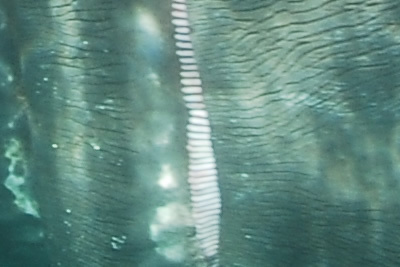 Basking shark gill slits have big brushes called gill rakers in them. These look just like a grandma’s sweeping brush, only pink. They use these, covered in snotty mucous, to trap their food. FACT 4: Have YOU ever eaten too much? A big basking shark stomach is about the same size as a bath full of half-digested smelly pink shrimps. in GALLONS of slimy, snot-like mucous that they swallow with their food: GROSS! you would find that it is covered in slime a bit like the black oil on your bicycle chain! It smells fishy too! FACT 7: When basking sharks rub against one another …. they leave a fishy smelling oily slick in the water! because it is covered in MILLIONS of scales like tiny shark teeth! In the old days they used to make it into leather for non-slip boot soles. Those boots must have smelled very bad! FACT 9: Basking sharks have fish lice around their gills! 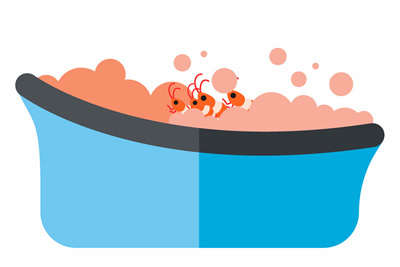 Fishy fleas but no flea shampoo or school nurse to stop their itches! They have to hope that birds or fish will pick the shrimpy fish lice off their skin.